Wednesday’s revelations in The Guardian, revealing large scale conflicts of interest prevalent in the controversial divestment working group, have thrown into question whose interests our University is run in. The working group, which aimed to examine the ‘advantages and disadvantages’ of full divestment, was installed by the University after staff voted to support divestment in a supposedly binding grace in 2017. The article uncovered that Prof. Simon Redfern, head of the Earth Sciences department and member of the divestment working group, was overseeing two major donations from fossil fuel giants BP and BHP Billiton at the time. The donations in question – £20 million from BHP, a multinational mining, metals and petroleum company, and £2 million from BP – were intended for a new Earth Sciences department. While the BHP donation has since been pulled, BP donations have funded the BP institute since 1998, helping research “recovery from challenging and mature reservoirs” to extract more fossil fuels, in a world where burning even a third of current reserves would have devastating consequences. The Vice-Chair of the divestment working group John Shakeshaft was also aware of the donations, with both Redfern and Shakeshaft opposing divestment, and failing to disclose this conflict of interest. This information completely undermines the decision of the working group not to divest from fossil fuels in June 2018 and calls into question the very democracy of the University itself. As students we should be able to expect thorough and transparent decision-making in all matters, but it seems that yet again we have been failed in this regard. 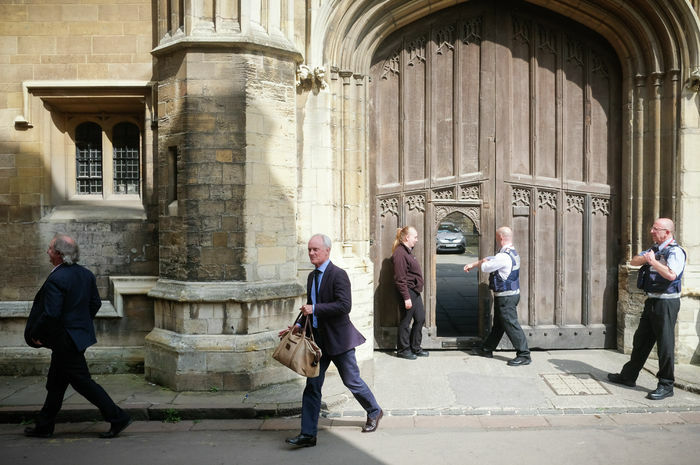 Cambridge has chosen to undermine the voices of student and staff – but at what cost? Not only have members of the working group been implicated in this scandal, but it has become clear how deep the University’s links to fossil fuel companies run. Vice-Chancellor Stephen Toope was aware of Redfern’s overseeing of the donations. These revelations highlight the dearth of democracy within the University administration as they work with fossil fuel companies. University management has shown that it is prepared to set aside the concerns of students and academics in favour of pursuing profit. This is outrageous: Cambridge should be leading the way and setting an example in the fight against climate catastrophe, not adding to it. The scandal doesn’t end here. As well as the involvement of Toope and Redfern in these practices, The Guardian article has also revealed the extent of the connections between the high levels of University administration and the fossil fuel industry. Other members of the divestment working group also have links to Shell, Total, BP, and fracking companies such as Cuadrilla and Centrica, through research projects, personal investments and past work. As a centre for world-leading research, including in climate science, Cambridge has a responsibility to look to the future and take action against exploitative companies that are harming too many, disproportionately in the Global South. BHP, for example is facing a £5bn lawsuit here in the UK on behalf of some 240,000 people in Brazil, after the Samarco Dam collapse in 2015, which destroyed homes and livelihoods. It is clear that Cambridge is prioritising financial profit not just over their students and academics, but over moral imperatives. Understandably, in light of this new information, Cambridge Zero Carbon Society are calling for the decision of the working group to be revoked. They are also demanding that the University launch an immediate, transparent and democratic process to look into how Cambridge could fully divest from fossil fuels. It is only through revoking the oil-stained divestment report, in addition to launching a new process which fairly investigates the practicalities of divestment – in line with the democratic grace of Regent House in 2017 – that the University can begin to regain the trust of its students and staff. Divestment is the first step. Our next push should be for the University to cut all ties with destructive fossil fuel companies, the top 100 of which have been responsible for more than 70% of the world’s greenhouse gas emissions. Research funds and institutes such as Cambridge’s with BP allow these ruthless companies to accrue positive PR, whilst all the while driving us further into the throes of climate emergency. By cutting all ties with these companies Cambridge would prove to its staff, students, and the world that it is part of the solution not the problem – ensuring its place on the right side of history, for a change.